Fundalucia is a wonderful hostel; especially if you are looking for a place to relax and recuperate. Make sure to look up the bus schedule ahead of time as there’s only one bus from Granada to the remote location. This is NOT a party hostel (which is exactly what I wanted). It offers a beautiful patio on which I recommend reading, meditating, or watching sun rise and set. The owner is incredibly friendly and has a plethora of local knowledge. I recommend any spiritual person stay here. Amazing! I booked 1 night and stayed 4.. It’s a great place for people who wanna escape the rush of the city. The nature is beautiful and the hostel feels as your own home! I defiantly recomand the place! One of the best things to do in Granada is to experience this small village subtle vibe and nature! Village name: quentar Landlord is helpful and nice ! A beautiful place to cook your own meals and to take a rest from city life! The place is perfectly in harmony with the nature around, made in wood, a very relaxing atmosphere, people are very friendly and the bonus is one of the owners, a very interested and spiritual person always available for a deep conversation. The Hostel is located in an amazing place, the staff is extremely kind and they make you feel like home. The whole space is managed as if it’s your own place, and the sharing of it goes together with it. The experience was really nice and comforting overall. I have stayed in over 30 hostels over my backpacking adventures. None have been as life changing as fundalucia. The owners are beautiful, kind, and one in a million kind of people. It is beautiful. It has an old time charm as well as a mountain/rustic/farm appearance. Absolutely amazing! They were so good to me and the friendships formed were amazing there! An extremely peaceful place full of wonder and beauty. The guesthouse is relaxing, cosy and surrounded by the most beautiful mountainous landscape. Everyone working there is filled with warm energy and generosity. I am so grateful to have stumbled across this place and wish I could have stayed much longer than I did. Fantastic environmenet, idyllic atmosphere, it’s the island of peace. If you would like to relax, far from your problems, don’t hezitate to stay here. The Fundalucia was an amazing find. It’s about 30 minutes from Granada by bus and incredible calming place to stay. If you like chilling staring at the hills this is the place for you. There is a walk to the lake that is incredible. The kitchen facilities are amazing with spices and basic food available. As well as cabinet good available for purchase. There is also a ran turtle, cat and Charlie the dog that make the stay. This was a return visit after being here same time two years ago. Absolutely blissful and tranquil retreat and again met up with some great people,going out hiking the stunning Sierra Nevada mountain range on Christmas Day. This guesthouse has everything you need for a peaceful escape. So peaceful and comfortable. Has everything you need. Definitely worth getting outside granada. Beautiful views! Really comfortable beds and pillows, and really clean. We stayed for two nights and went on the hike recommended by the owner. Also has a lovely selection of free tea. Fundalucia was one of the best places we have ever stayed. Exactly what you would want if you’re after a relaxed get away to escape that city life. The staff and especially the owner Thomas really made our experience what it was. The facilities were perfect and they offered more then we could have asked for! We will definitely be back the next time we are in the area! They couldn’t keep us away! Amazing little place in a little haven. Friendly staff, will recommend to my friends as little mountain retreat. The hostel is a very comfortable place. As soon as I walked in I felt good about it. Everything is kept very clean and in order and the people are friendly and welcoming, making you feel at home. In addition to this, it is located at a great location, resulting in beautiful views on the hills surrounding the village from the terrace. It is easy to relax in the hostel, or go hiking to explore the surroundings. If you want to explore the city, Granada is only a 30 minute busride away. To relax after a day skiing or walking around the mountains, with the wood burning in the fireplace. Or to enjoy the views from the picturesque garden. I initially booked her for four nights, but I felt so relaxed here I extended my stay for a further four nights. This is the place to stay if you want a relaxing haven. I would get up in the morning, have breakfast and then just relax on the patio taking in the stunning views of the Sierra Nevada. The rooms were spacious and clean. The cozy lounge with the log fire and well equipped kitchen, together the the friendly and helpful staff gave the place an immediate feeling of homeliness. Beautiful views in a relaxing hostel. If your looking for a homely feel in a quiet village for a few days Fundalucia will provide. I cycled around the winding mountain roads and found much beauty. We loved this hostel, it is a perfect place to relax! The whole place is decorated like a nepalese mountain hut. The fire in the lounge was going all day and night and there was even a cat. The owner is very nice and as it is a small hostel there was a very sociable vibe. The kitchen facilities and bathrooms are all good. There is a large selection of free teas and can buy essentials like butter/ rise from a cupboard. The town itself is good for day trips into granada and the mountains. I spent a few days ther and had not expected to find such a beautiful place! The hostel has a lot of peace and quiet for a few days there 🙂 treatment is very warm and familiar. There is also the lake nearby for a swim. I would stay again without thinking it twice. What an amazing place to stay if you are looking to relax and maybe take a few hikes etc. this was perfect after a few days in busy Barcelona. Hidden gem in the mountains. I wasn’t sure what to expect when I arrived at this guesthouse, but I knew I made the right decision from the moment I walked in. They were incredibly welcoming and it feels less like a hostel or guesthouse and more like a family. It is small and quiet and the views from the outdoor terrace were incredible. The hike down to the lake is well worth it and I recommend renting kayaks as well – saves you the trek down there and kayaking around the lake and into the cave was a blast. The village is small and quant and the people are very friendly. The owner also offers hypnotherapy which I took advantage of and found very interesting. If you’re looking for some peace and relaxation away from the city, this is the place. I miss it already and am already planning a return visit. Amazing stay ! We whole-heartedly recommend Fundalucia for groups of travellers or couples as we have stayed there as both and an amazing time. Warm and inviting, the houses are in great locations with wonderful views and hosts! We´re looking forward to going again!! A great escape from the big city, we loved it. relaxed atmosphere, very helpful staff and a very nice pool. Make use of Axel’s taxi service from Granada to Fun-da-lucia, you don’t want to go up fully packed. The pool has a time curfew, nevertheless we enjoyed it! The walk up to the lake is worth it, make sure you do it in the morning or late afternoon and bring water. The shower could have a bit more pressure but that’s really the only thing for improvement we can think of. come and relax. Our group loved our stay at Fun-da-lucia. At first we weren’t sure about staying outside Granada, but we loved Quentar! The scenery was gorgeous and it was very easy to get to and from Granada by bus. The hostel has a full kitchen available for guests to use, and staff were extremely friendly and helpful. Granada was our favorite stop in Spain, in part due to this hostel stay. We wished we had had more time to spend here! If you want to spend a few days away from the city (only 30min drive from Grenada) this place is very nice. A house in the hills to enjoy a bit of freshness. Axel was very nice and helped us a lot about interesting things to do around and hikes. The communication was perfect. A charming and relaxed atmosphere where we lived in contact with other residents and visitors. The house is well maintained and pretty. If you want to enjoy the pool, know that it is accessible 4 hours per day. I recommend this place! We had a great 10 days in this very sweet cottage in beautiful Quentar. It was great to be able to use the pool/internet/other facilities at Axel’s place. From Quentar, it was really easy to get to Granada by bus so we could see the sights. Quentar itself had lovely restaurants (and usefully – a cashpoint and pharmacy). We landed late on a Sunday and Axel collected us from Granada airport for a small fee which made our arrival really easy. He was ready to help and recommend things throughout our stay – including where to hire scooters. So overall – a beautiful, relaxed place to escape to at a great price! We’ll be back! great place! gracious hosts and caring! good advice for getaways … the sierra nevada is amazing! the house was very comfortable, and we recommend this place! Too bad we only stayed one night there! 20 minutes from the Alhambra in Granada and the beautiful old streets … Great! Definitely recommendable. We very much enjoyed our short stay at Fundalucia. We (two female travellers) had booked a private room ensuite and ended up with an actual tiny house that was fully equipped – bathroom, kitchen, fridge, washing machine and bedrooms. It was located a few minutes walk from the Hostel itself. The staff was very friendly and helpful. Nice house in a typical village near Granada (20 mn). 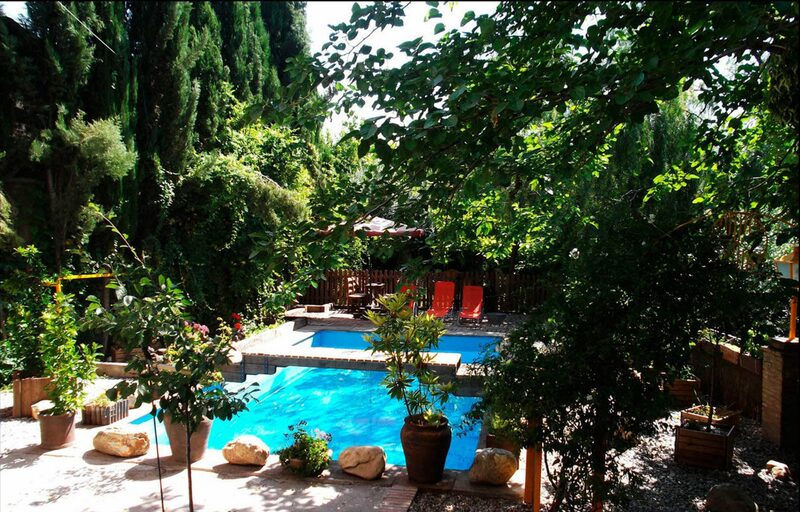 You need to walk 5 mn to go Axel house where you can swim in his comfortable pool or stay in his lovely terrace/garden. A good place to stay and discover Granada, Sierra Nevada and Costa Del Sol! A great apartment for a nice price.Basically all a tourist needs for a short or long stay.A nice, clean, well equipped and very close to everything. So if you want to live next to Granada and are traveling with the love of your life, the flat is highly recomendable.Axel gave us the most amazing welcome, with care and attention to every detail we could have wished for! We had a lovely time at fun-da-lucia! We stayed at a private room with own bathroom which turned out to be a lovely little house in the village about 5mins walk from the main hostel. We had our own tiny balcony, kitchen with a stove, living room with TV and video player, and shower/toilet room. The village is small and sleepy, but it’s pretty and not far from the buzz of Granada. The guy managing this place is very friendly and knowledgeable, he is also a guide in Granada. Very comfortable and warm … A little haven away from the tourists. I treasure the memory of my stay at the Fundalucia Hostel in a special place in my heart. I happened to chose to stop by Quentar searching for some quiet time away from Granada. It proved to be a real turning point and one of the defining moments of my life. The generosity and presence I encountered from the people running the hostel opened up new doors in ways of relating to myself and others. And the atmosphere of the village and the mountains kind of make the spinning wheels of everyday life stop. I also loved the little “Mini Market” cupboard in the kitchen 🙂 and the patio, and my room was very peaceful. I guess you could say my soulsearching travels brought me there with perfect timing. I will be forever thankful for that. Far way better than expected. We met great people, stayed in a privileged environment and enjoyed enormously the company. We’ll come back for sure to have more time to enjoy all that Granada has to offer. Staff was really kind, and they even give us medicines!! Highly recommended! A haven away from home”I stayed at Fundalucia Hostel in september 2012 not quite knowing what to expect and now that I am home from my year long travelling stint I can confidently say that the week I spent there was one of my best and most worthwhile whilst travelling. I arrived at the hostel after recently being sick and Axle was the most gracious and welcoming host, offering me a home cooked meal every day, ample knowledge of the area, and enjoyable company. I had a great time exploring the surrounding area and going for walks with the owners dog. The Hostel itself offers a very clean and comforting environment with a lovely kitchen and living area, plus a beautiful outdoor area which was great for relaxing. It is located a fair distance out of town but the bus was easy enough to take to get to and from the hostel. Trust me the 25 minute bus ride is well worth it! Quentar is a lovely little village with much to offer for the right person. Staying at Fundalucia was the highlight of my trip! A cozy cabin like hostel tucked away in a beautiful little village. I would definitely return if i am ever near Granada again. This hostel was amazing! Perfect place, mountains from the window, authentic village, friendly staff and really good price. It was definitely the best hostel of all our trip around Andalucia! I had a wonderful time. The hostel was so cosy that it felt less like a hostel and more like staying at a friend’s home. The staff were amazingly warm and friendly. Danke für alles, Axel! Amazing location, you get to see a part of Spain outside of the busy cities and tourist attractions. Really relaxing and pleasurable time. We would definitely go visit again! The only bad part about our trip was our camera dying before our vacation was over. Very beautiful decor, close to the supermarket that has everything you need, the bus stop is 3 minutes away, amazing views. The private house is beautiful and private, and the main house had a great atmosphere. I had a very peaceful, relaxing stay at the hostel. It was cozy, clean, and quiet. It was exactly what i was looking for, and I would love to go back. The staff was helpful and sweet. It was easy to get into Granada when I wanted to, but it was also nice to be staying outside of the city. Perfect for a calm, quiet weekend. An amazing Hostel, I don’t think I’ve ever slept in a more cozy bed. The directions on how to get there could have been a bit more specific, however getting there was much more rewarding for the effort. The village itself is breathtaking, and having a free spot to park the car is always a huge plus. Alll in all, an amazing hostel. This place is really special and a perfect place to relax! It feels like a home rather than a hostel. There is a great kitchen for cooking meals, a fire place and a beautiful view from the front garden. I went on a couple of walks through the mountains and surrounding farms. It rained a lot so I didn’t get to try the new kayaks and bicycles but I couldn’t have imagined a nicer place to be while it was raining. I enjoyed our conversations very much too Axel. I hope to return again sometime. Many thanks to all at fundalucia! I stayed at Fundalucia Hostel in september 2012 not quite knowing what to expect and now that I am home from my year long travelling stint I can confidently say that the week I spent there was one of my best and most worthwhile whilst travelling. I arrived at the hostel after recently being sick and Axle was the most gracious and welcoming host, offering me a home cooked meal every day, ample knowledge of the area, and enjoyable company. I had a great time exploring the surrounding area and going for walks with the owners dog. The Hostel itself offers a very clean and comforting environment with a lovely kitchen and living area, plus a beautiful outdoor area which was great for relaxing. Travelling through Granda with a rental car, we decided we wanted to stay off the beaten path a little bit and headed out to Quentar. We had no reservations, showed up to this very quiet, beautiful town at 10 pm, figured out how to call the hostel, and they ended up coming to find us and took us to a LOVELY house. It was just us. It was the best 12 Euros/night we spent. If you are allergic to cats, please let them know ahead of time. They have a few properties in Quentar and the one we stayed at had a very sweet cat who loves to cuddle (I love cats, so I had NO problem with this). They let us do laundry for free. They have a beautiful courtyard and it is very tucked away. Such a great experience. I greatly enjoyed my stay here! The hostel is well kept and very cozy (spacious rooms, no bunk beds, it has a living room and a patio). The environment is welcoming and friendly. The owner and the manager have lived there for many years and are very helpful in planning your stay and visits. It comes highly recommended. Everything about our stay at Fun-da-Lucia was perfect. The kitchen is fully equiped and the supermarket is across the square, there’s a great TV and with DVDs at your disposal and high-speed internet. There are lots of nice walks you can do around Quentar and its easy to get into Granada. I booked this marvelous housing on hostelworld and it is a pity that their links for reviewing did not show in my inbox. From the page I read some comments that the town was boring and there was absolutely nothing to do. Lodging quality was excellent, and I’m a real whiner. Since the main house was all booked, we stayed in a small three storied house. We had our own kitchen, bathroom, TV and lots of books and DVDs to dip into. Only inconvenience was that the internet point was 5 minutes up the hill. On the other hand, knowing our party we would have never got offline and enjoy each others company and wine if we would have had it. At the moment I live in Madrid and the contrast was heavy. Every morning we were woken up by singing birds and the suns reflection on the opposite golden hillside. Ultimate relaxation. I adored the place and Definitely want to revisit it once… at least once. Ps. The place is a bit hard to find, but when You find it, You don’t want to find the way back for a while. the location is great with astonishing landscapes even though it was hard to find on the first day. The house is cute and well furbished. It’s better to have a car as there is only one bus per hour to granada in the village but if you go to the nearby city there are buses every ten minutes. We definitely recommend it and if if we go to andalousia again, we’ll stay there again.